Government has ruled out an extension of spreading season or exemptions. Sligo Dail Deputy Eamon Scanlon is apparently concerned following the Government’s refusal to allow slurry spreading outside last weekend’s closing date for the spreading season. He reportedly said farmers were “up all night” trying to get slurry spread before the October 15 deadline but failed to complete the operation owing to severe weather, flooding and wet ground. He is also said to have stated that some farmers “are facing animal welfare issues” because of full slurry tanks, and has provided a telephone number where those affected can contact the Department of Agriculture. 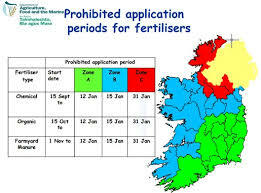 However, the Department of Local Government within whose remit the EU Nitrates Directive slurry spreading controls are administered said at the weekend that the Minister, Simon Coveney has not extended or amended the final date for the application of organic fertilisers, including animal slurry. They also stated that no exemptions had been granted.